The surprising real story about this year's Northeast passage transit: The media botched it | Watts Up With That? First, let’s get our bearings. Unlike the Northwest passage, which traverses the icy north above Canada, the Northeast passage is an entirely different route, shown on the map in red. From The Register: Also called the Northeast Passage or North Sea Passage, it’s a trade route that in summer months links the North European and Siberian ports to Asia, around the Arctic Circle. Orient-bound traffic heads east, then South via the Bering Strait. The route offers significant gains over the alternatives via Suez or the Cape, it’s shorter, quicker and cheaper. But until technological advances in the early 20th Century it was considered too hazardous for commercial operation. The merchant ships MV Beluga Fraternity and MV Beluga Foresight arrived this week in Yamburg, Siberia. Ownership is Beluga Group Shipping Gmbh. From the company website: “During the passed days which led through the East Siberian Sea, the Sannikov Strait and the Vilkizki Strait as northernmost part the Beluga vessels were part of a little convoy behind the Russian Atomflot-ice breakers “50 let Pobedy” and “Rossia”.”. “We are all very proud and delighted to be the first western shipping company which has successfully transited the legendary Northeast-Passage and delivered the sensitive cargo safely through this extraordinarily demanding sea area”, Niels Stolberg said, President and CEO of Beluga Shipping GmbH, after the masters Captain Aleksander Antonov and Captain Valeriy Durov had notified that they had dropped anchor at their port of destination. “To transit the Northeast-Passage so well and professionally without incidents on the premiere trip is the result of our extremely thorough and accurate preparation as well as the outstanding team work between our attentive captains, our reliable meteorologists and our engaged crew”, said Stolberg. Climate change has allowed the Northeast Passage to be used as a commercial shipping route for the first time. Impressive – if only it were true. To help you navigate the changing world we have more dedicated science and environment correspondents than the Guardian, Daily Telegraph, Daily Mail or Independent. Only one problem: The Northeast Passage has been opened for commerce since 1934 – and never ‘closed’. Over the years hundreds of thousands of freighters have passed through, and after Russia put Soviet-era politics aside it was extended to foreign commerce in the 1990s. As the Register reported two weeks ago. It’s a disaster all right, a disaster of bad journalism. I won’t mince words. It’s crap. But we all know the MSM can’t get much right these days. My guess is that the MSM simply confused the difficult and almost always closed Northwest passage with the Northeast passage. Bloggers once again were the leaders in discovering the real truth instead of paid journalists. Is it really so hard to use Google? For example the EU referendum had details and pictures of many previous transits of the Northeast passage. In this story, they show the history of this shipping lane. Read the details of the latest failure of journalism turned advertising opportunity in the UK Register, here. Thanks to Andrew Orlowski of the register for his assistance with this story. Readers, especially those in the UK, I’d like to make a suggestion. Let the Times know they screwed up, not only for the journalistic failure, but also for the touting of the failure as advertising. Letters to the editor, letters to the managements, and to the advertising office might be a good start. If nobody calls them on it, they’ll never learn. October 7, 2009 in Alarmism, Arctic, media. I brought all of this to Andy Revkin after he made the mistake of repeating the company propaganda about any kind of “first” here. I included multiple links detailing the extent of shipping traffic along the same route for the past several decades. He declined to amend his story. Pity the journalism isn’t equally fabulous. It must be nice to have a gig where you can do sloppy work, be dead wrong, and still be proud enough to put your name on it. Is it any wonder that newspaper readership is declining? This is just evidence of what the “Intelligentsia” at the world’s universities is calling an education these days. They spend all of their time indoctrinating our youth in liberal ideology and not teaching them what they need to know to operate in the real world. If this were an isolated incident it would be one thing, but it’s not. So why do we continue to allow these idiots to run the world? Already sent letter to Times days ago but not living in London didn’t know about the advertising so I will send another one. Anyone with a map who knew that Murmansk and Archangel’sk were important Soviet ports should have known this story was bogus. Oh, that’s right, that cuts out most journo’s. It is horrendously frustrating when the media , as they have always done , distort reality. This is a typical example of how the public perception can be manipulated. I often hear arguments of how the fabled passage could only in modern times be negotiated on a regular basis but lacking in the arguments are of course modern ships. There is no question of wooden ships breaking ice, that is not possible. The fact that modern steel reinforced 18 inch plus nuclear powered rowing boats can do it in the “modern climate” is lost on the MSM. The simple fact that these wooden boats have traversed the passage in the past says it all. But the NE Passage opened in 1934. Hmmmm one of those early pre-CO2 warmest years in recorded history. And this was still when all of the many vodka-cold Soviet temperature measurement stations were intact and without all the urban heat islands and Anthony’s airports. I got it: Why doesn’t the IPCC file to make AGW officially retroactive to 1934! Wouldn’t put it past them…. I am visiting Britain this week and the amount of green hand-wringing is enough to make any sane person cringe. The Times may not have their facts right, but what they write seems to have broad appeal. Interesting that the UK Conservative Party is beginning to campaign on a platform of ‘harsh reality’, in marked contrast to Labour who just want to tell people that everything will be all right as long as money gets thrown at it. I hope their willingness to convey reality to the masses includes some truth about climate change. The Narrative is the larger truth, details like 70 years of previous transits just get in the way of the story and will confuse readers. The sound of young Times interns hurriedly ripping papers off underground carriages all over London. I was in London yesterday and those posters were really all over “the tube”. Are the Times journalists uneducated or just cynical? Perception is a cause for emotional distress or glee. When a topic begins with a certain perception implied, the conversation is usually steered in the direction of the implied perception. Is this Science? It’s not just the media – I recently went to a talk in my village addressed by a polar explorer who swore blind that it was a “myth” that the north-east passage was open before very recently. I recall back in the 1980’s when I lived in Vancouver BC seeing Soviet grain ships in the harbor that had ice breaker bows. I was told back then the Soviets used these ships to transport grain to Siberia and Europe via the NE Passage. The only good thing is that they will spend all their time arguing over Europe and ‘decarbonising’ the UK will take a back seat. Sorry, those links were meant to be different ! Not quite sure what happened there. Create the problem, Steer the reaction, Those who created the problem propose the solution. Manufacture cognitive dissonance. Do it over and over again. This is the Hegelian Dialectic. Did my bit. I’ve made a complaint to the Ed of The Times and a formal complaint to the ASA. Hope all other Brits here are doing the same – it only took me a minute to fill in the ASA form. Shipping via this route is hardly news. What was news was that someone other than the Soviets used the route. So it was a first for “non-Soviet Commercial traffic”. It’s interesting to note that the shipping season is Aug 1 to Sept 15th. Winds and depths as shallow as 8M make this journey especially hazardous. If I was a journalist it would sure be easy to google a story as a means to check it for accuracy. Tony Halpin of “The Times”, may have been the writer of this unfortunate piece of journalistic underachievement…. Imagine not being able to understand the difference between NW Passage and NE Passage?…. Anyway, be that as it may, can I ask who the hell the editor was. Mr Magoo? Imagine wasting your money advertising with them! May as well throw your advertising budget in the toilet. Everybody turn in your degrees if you went to a liberal arts college. You should have gone to a Conservative Arts College. Shame on you. Because most human beings lack the urge to question. They have not been taught to question or be skeptical, except toward the opponents of accepted doctrine. There, they sit smug in the arms of the main stream media that feeds them stories like this. Replacing fact and historical record with carefully crafted messages that keep them comfortably numb. They are sheeple. Until woken. But truth is a wicked sword. And the quarantine thereon will be lifted – shortly. And these deformers of fact will be asked to explain themselves. And they will claim “We lied for the greater good.” And someone will have to judge the veracity of that claim. The Times is part of the Murdoch media empie. It does what he tells it to do. His son runs the Sky satellite TV arm. The son seems to be greener than green. Quite why he can’t see that the greenest thing he could do, as a person running a TV business that clearly uses a lot of ‘fossil fuel’ in both production and delivery, would be to close the business is something I don’t understand. He is, as I understand it, the product of the finest US education establishments. One would have thought the logic would be obvious. BTW the mention of ‘hundreds of thousand of ships’ is likely wrong, though ‘hundreds of thousands of tons of shipments’ would be likely right. People ‘in power’ really don’t care about the reality of the situation. Those who desire social influence and control have found the perfect vehicle. Those who have more than enough wealth for any changes in the world to be meaningless for them personally have found a new way to gather more wealth for themselves, thus fortifying thier place. Neither group are likely to want to upset the other too much, hence why so many large corporations simply rolled over and now support the socialist charge. The suckers in the middle will end up feeling the brunt of the effect in ways they did not anticipate when they decided that they would be safe just letting others make the decisions for them. But they will probably never realise what is going on around them whilst the global Murdoch machine, along with others, tells it like it isn’t. That should, of course, have read “Murdoch Media empire”. RC actually published my previous comment. I remember reading with amusement your article about ships navigating the North East Passage “for the first time”, and how this was a sure sign of the effects of Global Warming. I assume your journalists are very hard pressed and short of time, as 2 minutes googling or a short visit to Wikipedia will show that it wasn’t the first time. The passage is also known as the Northern Sea Route, and a Directorate was set up by the Soviets in 1932 to manage it. I now read in the Register that you are parading your mistake all over the London Underground system. Astonishing! The dead tree press has got serious competition from the internet. Your business model will surely fail if readers have to do the double-checking your journalists should have done in the first place. Yes, and it has occurred to me that according to the NSIDC sea ice index, had the NW passage been in the state it was this year, Amundsen in his Gøa would never have been able to get through in 1905. And in 2007 the NE passage seems to have been closed. How do the warmists explain that? Here is some more incite into the Hegelian Dialectic if you are interested. Anthony, the title of this entry is incorrect. It is not surprising AT ALL that the media botched it. 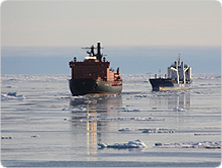 Russia is the largest user of the Northeast passage and sends 200,000 tons of cargo through there each year. It was closed to the free West during the time of Communist Russia, while Russians used the Northern Sea Route regularly and established various Arctic ports on the way that have now fallen into disuse. The Beluga ships planned to be the first Western commercial ships to do the run without icebreakers, but in the end there was a Russian icebreaker there. Beluga is a Bremen-based shipping company, founded 1995, now 63 large vessels, evidently skyrocketing with the help of Times ads. and sent a hard copy to my son’s teacher. we all know that that it is not true. What is not so clear is whether it breaches the advertisers’ code of conduct. From personal experience, a complaint to the ASA is time-consuming to prepare. It is also likely to fail and rebound. By all means write to The Times but I’d advise caution before getting embroiled in an ASA complaint, esp as it can legitimately be argued that anyone here who does so is using a complaints procedure to make a political point. Since the Times took a shot at the other papers, perhaps writing to the Guardian, Daily Telegraph, Daily Mail, and Independent would be more productive than writing the Times. Boudu, nice work with the animations! I’ll print out this article at The Times where I work and leave copies littered about the place tomorrow. Historic to journalists who haven’t learned to research their stories. i think it is the duty and interest of the beluga company to correct the unture story (again appearing in their report on their webpage). it should be in their own interest, that their customers and competitors do not regard this company as one that promotes and takes advantage on the basis of an untrue story. If you believe in the premise of the book 1421, and I do, the Chinese sailed across the top of Europe and Asia on their return voyage. In his first book, 1421, Gavin Menzies argues that a huge Chinese fleet circumnavigated and charted the world years before the first great European voyages of discovery. The evidence for this comes in many different forms: from shipwrecks and ancient maps, to local peoples accounts and their DNA. I consider it to be incumbent upon you to become acquainted with the contents of the article referenced here http://wattsupwiththat.com/2009/10/07/the-surprising-real-story-about-this-years-northeast-passage-transit/ . I would then consider it incumbent upon you to require your ‘science’ correspondent to undertake some remedial journalism education, primarily in the area of factual checking. Finally I would request that the advertising campaign, which you have mounted primarily in my experience on the London Underground and which is based on the fallacious story published in your erstwhile august pages, be removed forthwith. 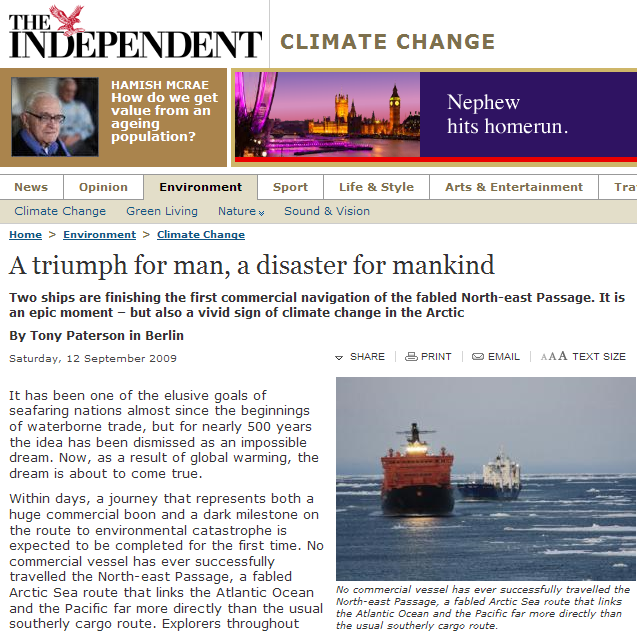 “The advertisement relied on a story printed earlier in the Times and linked a supposed maritime feat to global warming. The story related to the alleged first passage of cargo vessels through the North East sea route accomplished in 2009. The story was manifestly false as this sea route has been in relatively regular use since 1934. No politics here, just simple fact! writing alarmism about climate sells, but hanging ads on the london tubes costs money. this is not ignorance or the usual media BS, this is something carefully planned, and someone is paying for it. Obviously. As ‘tomorrow’ never comes (as soon as you get there, it’s ‘today’) so they never have to check those inconvenient facts. A good thing, as many of them wouldn’t know how. The science is settled. The dabate is over. Eliminate the need for thinking. Pacify the folks carrying torches, pitchforks, tar and feathers. How’s the weather on Mars? Can we move there yet? Russian Atomflot-ice breakers “50 let Pobedy” and “Rossia”. Incidentally I think that transliterates as ’50 years since victory’ and ‘(obvious)’. Personally I think the more extreme and ridiculous the press on alarmist AGW becomes the better. Where comments are allowed, the tenor is so hostile in the UK now that many of the ‘environmental’ page pieces have withdrawn the readers comments facility. They actually are digging their own grave. The transit of the Northern Sea Route has be annual event for years. In the early 1960’s when I was in the navy, we followed it closely as it was used to supply the forward (strategic) airbases the Soviets used during the winter. This year may have been the first open to non-Russian commercial shipping, but it has been a regular event for well over 50 years. Out of interest if Franklin had attempted the Northwest Passage in a modern atomic ice breaker would he have made it? During the winter, the ice along the northern seaways varies in thickness from 1.2 to 2.0 metres (3.9 to 6.5 feet). The ice in central parts of the Arctic Ocean is on average 2.5 metres (8.2 ft) thick. Nuclear-powered icebreakers can force through this ice at speeds up to 10 knots (19 km/h, 12mph)”. These ships must cruise in cold water, in order to cool their reactors. As a result, they cannot pass through the tropics to undertake voyages in the Southern Hemisphere. Where does all that heat go? So far the Global Temp averages to 0.23 C, what was it last year? I’d just like to correct some commenters. News Intenarional publications such as The Times are far less alarmist than the competition who purposely set out to be alarming to compliment their leftwing ideology which must create crisis in order to further their agendas. Murdoch is not a leftwinger and Fox News is one of the few outlets brave enough to challenge global warming hysteria, even if they use the some what comical Glenn Beck to do it. Just two weeks ago we had a seminar at News International called ‘Hair Shirts and the Apocalypse’ I’m not sure what it was about but the title says a lot. But in general journalists really need to do their homework. Unfortunately we are seeing science journalism slide downhill. It has been like that ever since Carl Sagan died and the Internet gave voice to millions of cretinous activists. No wonder the dead-tree media is crashing. The German merchant ship ‘Komet’ made this transit in the summer of 1940, departing Norway in July 1940 and entering the North Pacific Ocean via the Bering Strait in September 1940, she was also assisted in her passage, by then Soviet Union ice-breakers. The ‘Komet’ was a merchant ship armed with concealed heavy calibre guns, mines and torpedoes, her purpose was to sneak up on unarmed merchant ships and then suddenly open fire and sink them. No point writing to the Guardian. The paper I have read for over 40 years is, unfortunately, wedded to climate change. Its journalistic standards have dropped dramatically over those years, especially the last decade. Folks. This kind of stuff is DELIBERATE. The meeting in Copenhagen is coming up. Does anyone seriously think that every editor was in ignorance before permitting this to be printed? The advertising campaign had to be planned in advance, and funded. No one, not one, fact checked it? Face facts — how many people saw the advertising, read the stories in the Times, or the Register, or Guardian, or listened to the BBC — but won’t see the quiet buried retractions? Plus the papers copy each other. Go to, for example, google news and type in “northeast passage” and view all articles. See how many papers around the world picked up this story with the same wording. This is organized, people. And it is deliberate. It is the technique of the big lie. Every week from here, from there, is another drip drip drip bogus global warming climate change story. And we, on blogs like this, know it is a lie. But only some thousands, perhaps tens of thousands of people read here. But tens of millions read the lies, hear the lies. Not much point in writing the The Independent, it’s locked in talks with the banks trying to stave off closure. I don’t think they have money for any real journalists. Their office staff just re-cycle stuff from the BBC, political parties and associated Quangos, but then in today’s UK, that is some job, there being in excess of 500 of them, each lobbying for more cash. Modern main stream journalism is easy, and it will continue to be until the public wake up. Should we then consider the Times piece “paid advertising”? i.e. 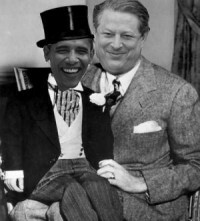 – nothing more than a plug for Global Warming paid for by Alarmist money collected faster than previously thought. Sometimes, the commercials get so out-of-hand one is reminded of fish stories…they grow over time. “And in 2007 the NE passage seems to have been closed. I read just last night that the wind in 2007 was such that it piled up ice in the NW passage. When I send an ordinary e-mail, I hit the Tab key twice to indent my name. Unfortunately…..doing that at WUWT causes one’s message to be sent prematurely. One would think the same folks that cry foul over George Will’s articles would find erroneous reporting about the Northeast Passage. I guess not. Don’t write to The Times – it would be far better to write to and alert all their competitors! The Times have made a complete fool of themselves – especially by portraying superiority and bashing their competitors publically over poor scientific journalism when they got their entire story muddled. Surely this was an April Fool article? Thanks for the link Anthony. Appreciated! Note also, Stolberg is something of a devotee of the climate change religion. The Times has a Dan Rather dotted eye on this, and then some. When this story originally broke, I had to spend all of 10 minutes on the net to know that is was contrived. I posted what I found same day. Anybody who spent a few minutes on the net could confirm what I posted. So, why does it take months for the Times competitors to check out thier rivals claims? My concerns at the time included the possibility that Medvedev or Putin would take exception to the Western Media using their good nature of allowing European ships to traverse the NE passage, to further political agenda. Russia is not exactly keen on the warmist lean on everything. Playing loose with the reporting can have unintended consequences. Did anyone bother to clear the story with the diplomatic channel? At the very least, Russia must think we’re a nation of crackpots. Not the best foot forward when the US is trying to get Russia to help out with the Iranian nuclear problem, what with a story they have to know is bogus. To me, this is very troublesome, not just the bad story. Things like this can get quickly blown out of proportion, and cause bad feelings. The story was published in The Australian a while ago. I wrote in, and they published my letter (but did not retract their original story). YOUR article (“German ships break the ice on trade frontier”, 15/9) begins, “It is a symbol of global warming” and goes on to say that the voyage of two German container ships through the Russian Northeast Passage was “considered impossible until a few years ago”. What tosh. The Russian Northeast Passage has been known to be navigable since the mid 1800s. Adolf Nordenskiold navigated the Northeast Passage from west to east in the Swedish steamship Vega in 1878, and in 1915 Russian hydrographer and surveyor Boris Vilkitsky made the passage from east to west. I have written to the “science editor” of a national newspaper, and to MPs, but (of course) to no avail. Sooner or later, preferably before Copenhagen, the MSM surely has to change tack, if we keep up the pressure. (Or are they trying to hold out until after Copenhagen?). Murdoch, in my opinion, follows his own path and makes that as good as it can be for Murdoch. Fair enough one might say but in reality I suspect he blows with the wind for political influence and what that might bring with it. The colour of his politics seems to vary with location and events as well. Quite why an Australian American should have so much influence over the British media and political parties I am not sure. Since he also works towards a pay per use model for the interent content of his media outlets one has to assume that he is not greatly in favour of free access to information. However whether he succeeds in making the internet pay and what his political stands are may be unimpportant once the EU bureaucracy takes central power for itself. The title of the seminar you mention is indeed interesting but, absent attending and listening, could have been anything. It’s a jump too far tosuggest this may have been and internal MSM political change of direction. If it was it suggests a very dysfunctional philosophy, given the nature of the adverts. Nevertheless we can but hope …. If you look at the Times story it looks like some comments by readers were already calling the Times to book on the shoddy journalism. GE is the big player in nuclear power. for GE uranium development and nuclear plant promotion. agw and nuke power are synonymous. built upon a foundation of deception. superDBA (09:01:41) : If this were an isolated incident it would be one thing, but it’s not. So why do we continue to allow these idiots to run the world? They not only need to remove the ads, they need to replace them with a correction, which does NOT contain a reference to global warming. Hmm, the whole point of this article was to research your statements. Swedish Vikings crossed the Baltic, primarily from Gotland. They entered several different rivers that flows into the Baltic. From there they traveled east and south all the way to Bagdad and Constantinople. There are no rivers in the Northest Passage that leads to the south. So, please check your facts, or a decent map. You will find that you are a bit off. Sorry for being picky. Swedes take some pride in their effect on Russian history. It didn’t include the northeast passage. Norwegian vikings went to Island, Greenland, but primarily to the British Islands and other points south (Paris, etc.). Even if, even if all this blithering MSM nonsense were partially true, wouldn’t it be a Good Thing to have faster, better trade routes? Deeper, too, right, as the seas rise from melting Greenland? Another bonus plus of global warming!!! I still have no problem with AGW; in fact, I yearn for it. wow at this guy. Is he deluded? Lying through his teeth or what? All these Beluga company vessels were built specially reinforced against ice. They thus, presumably, cost more than ordinary vessels and have less cargo capacity. It would be risky to have sent ordinary vessels through the route in company with them currently, since ordinary hulls and propellers would likely get dented and dinged by small ice debris left in the wake of an icebreaker. The two Beluga vessels that transited the Passage made their voyage because they were delivering heavy equipment from a manufacturer in Asia to a Siberian port. They then continued westwards to their homeport in Europe. They were not doing so because the NE passage to Europe is shorter and more economical. They had to wait in port in Asia (paying crew’s wages and port fees) for weeks before they got the green light from the Russians that the coast was the clearest it was going to get, and that their icebreakers were available. And speed was reduced during the portion of the voyage that required the icebreakers to clear a path ahead. These factors mean the route is not nearly economical yet for ordinary shipping. The Passage will only be as open as it was for a couple of weeks. Thereafter traversal will get harder. There’s only a brief open window at present. “This year is shaping up to have the third lowest amount of Arctic sea ice on record, just behind the worst year set in 2007 and in 2008. But just because 2009 is slightly up from the past two years, it is not an upward trend or a recovery, Serreze said. It reflects a change in local weather patterns that occurred in August, he said. “It’s certainly part of the overall decline of sea ice that we’ve been seeing,” Serreze said. But these won’t be full traversals of the Passage, just incursions and returns into the less-icy parts of the Arctic Ocean. …Yes, I’ve noticed this as well. The Telegraph, for instance, has been posting some of the stupidest global warming stories I’ve ever seen lately and none of them have comment boxes when most non-global warming stories have comment boxes. They obviously know these stories are a load of hysterical lying propaganda and don’t want the public telling them what they already know. How do I print this article out without the comments? I would have stopped reading the Guardian (or ther Manchester Guardian as it was known) decades ago when it was publishing George Bernard Shaw’s defence of Stalin’s progroms if I was alive back then. Ah the good MSM in the good ol’UK. No matter what you do, you will not get an apology for such sloppy reporting. In fact I am sure the author will get a pat on the back, maybe an Aston Martin, for the pro-AGW stance, no matter how totally wrong it is. Happening here in Australia too. You have to register to comment on SMH now, whereas previously you didn’t. I can’t gte my, usual public use, e-mail account registred. Highlight [select] the story but not the comments. Copy. Paste into any word program. Print. Well, I just submitted my complaint to the advertising standards. I suggest all you Brits think about doing the same. I think to use the word journalism about this piece is stretching credibility a bit. i. Have sufficient knowledge to comment accurately. ii. Have a sufficient professional reputation to protect. iii. Are prepared to put their professional reputation on the line to verify the claims of the story. 2. Does the Russian Government retain records on Russian commercial traffic through those waters? Archangel port authority?? Vladivostok?? 3. Are there media archives going back 150 years on microfiche/commercially available search engines to find earlier stories on this topic?? 4. Do residents of NE Siberia e.g. Kamchatka, Chukotka have sightings of ships over the years?? Asked any 80 year olds how long they’ve seen shipping going into the NE passage?? 3. Any Government aggressively promoting global warming. 4. The Suez Canal Authority. 5. The Panama Canal Shipping Authority. The thing is, right now, papers are being hammered financially. Really hammered. So they won’t be taking on journalists, they’ll be laying them off. Hardly an auspicious time for high quality journalism, is it?? – easy mistake to make! The norse (“vikings”) actually did go as far east along the Arctic coast as the White Sea and the mouth of the Dvina river (“Bjarmaland”). Something tells me that somebody is totally unaware of the 19.6 year lunar cycle that pumps warm water up towards the north and then goes away. And it peaked in (let see, now) 2006. The decreased ice and increased ice are not a surprise. This is very interesting information. It adds to the fact (as I understand it) that ice disappearance is due to both water temperature and air temperature, in addition to wind. I refer to ice “disappearance” rather than “melting”. Where can we get more information about this water flow? Sounds like a fair assessment of the situation to me. It appears that “Margaret Thatcher” is just a screen name, not the real MT. That’s a laugh! So that’s why they took it off Icecap. You have it backwards, Gjoa could have sailed through end to end this year whereas in 1905 it couldn’t. More newsworthy, this year re the NE Passage was traversed by two yachts, unaccompanied by ice-breakers. When I briefly scanned this in the local newspaper, I misread “northeast passage” for “northwest passage” and assumed they’d gone over Canada. Certainly I wasn’t aware that this was a long used traditional trade route. I’m writing a letter to the editor. Actually the swedish one was lucky enough to meet the “Beluga” convoy when they were stuck in the ice in Sannikov Strait and was helped to get loose by “50 years since Victory”. However I don’t blame you for missing this since it was only mentioned very discreetly in their swedish-language blog. Actually, there was an error but not the kind you think. The company claimed to be the first WESTERN company to make the passage with commercial ships, not the first ever. Adding WESTERN is a qualifier that makes the claim accurate. The media has jumped on it in error, but that doesnt make what is happening in the Arctic untrue – its just typical misreporting form journalists. If this is an example of your “evidence” that AGW isn’t happening, well you ceretainly haven’t convinced me. By the way, has anyone else noticed that despite this being a very low solar minimum AND despite the effects of La Nina, the global average temperature right now puts 2009 in the top ten hottest years? What happened to that cooling you were talking about? How come the end of that graph is heading up? How can the sun be the coldest we’ve ever seen it, and yet the earth is STILL warmer than at any time previous to 1998? Natural cycles are at work here for sure – they are DSIGUISING AGW for the SHORT TERM, and that term is coming to an end. For those of you who think it is all the sun, explain this. Look at that graph linked from Spencer in my previous comment. The last Solar maximum was in 2001 and since then the sun has been getting weaker until it hit minimum in the last couple of years. Throughout the entire period after 2001, the world was WARMER than during the last solar maximum, including right now, during what may be the deepest solar minimum we’ve ever seen. If the sun is the sole driver of climate, how come the world was getting warmer while the sun was getting colder? And why is it warmer now during minimum than during the last maximum? Another thing to note… there was one period after 2001 where temperatures dropped lower than 2001: the 2007-08 time period. That corresponds to the stongest La Nina event since 1988-89. Have a look at 1988-89 and compare to 2007-08. Notice anything? During both events, global average temperature dropped by about 0.3C but the 2007-08 event doesn’t drop below the 1979-1998 average, unlike the 1988-89 event. The world is clearly warmer now than then. Karmakaze – I have addressed just about every point in your last posts already in comments to WUWT, but not necessarily on this thread. I’ll go through your points one by one, but just at this moment am short of time. Please stay on this thread and I’ll get back to you. But first, I just have time to give you some preliminary data. Spencer’s graph only goes back to 1979 because it is from satellite data. Mine takes pre-satellite data from Hadcrut3 and goes back further – in it you can clearly see the global temperature cycles. A lot of the debate has centred around whether we are in a blip in a long term warming trend, or in the start of a cooling phase in a temperature cycle. This global temperature graph shows the phases visually. We are now in a cooling phase of a ~60-year temperature cycle, but there is also a modest long term rising trend. We can’t be sure that the phases will continue exactly as a continuation of the pattern, because we don’t understand the mechanisms. In particular, we don’t know how the current lack of solar activity will play out, though it would be reasonable to expect it to deliver a bit more cooling. I’ll get back to you with more detail hopefully within a day or two. K – in haste – you can read my past comments on this WUWT thread, relevant to many of your points. I’ll still try to get back to you within a day or two on the details. Remember the lesson of “The Boy Who Cried Wolf”. The assumption that there is or ever will be man-made climate change (Orwellian global warming?) is the big dead elephant in the room. I think all the politicians on the bandwagon need to be replaced by public servants who can objectively evaluate scientific and technical data. The backlash will be swift. No I was well aware of the encounter but my reading of the encounter (see below) was that it took place after they had cleared the ice. The other yacht had already made it through, unfortunately their attempt to complete a circumnavigation was forestalled by their being arrested and taken to court in the Bering St for problems with their paperwork back in Murmansk. “From the fog, one ice floe after another let loose. In the end, we arrived to a dense barrier of ice that effectively set a stop in our way. After a small consultation within the team, we decided to sail southwards. This was not an easy decision to take, because the ice was on its way there with the help of the wind, and in towards land. But according to the latest ice map, a northerly route would be an enormous detour. The last thing we wanted was to get stuck between ice and land. It was several nervous hours before we could eventually find a southerly route through the worst ice and sail east again. Right before darkness was to fall, we saw on our AIS and radar three ships on their way towards us. Via VHF radio, we could gladly verify that it was our friend Captain Dimitry, who onboard his icebreaker was escorting two cargo ships west through the ice. Fun to see Dimitry again, who we met in Saint Petersburg during our sailing training as well as in Murmansk during the actual trip. Dimitry’s ship, Fifty Years of Victory, is the world’s largest icebreaker and runs on two nuclear reactors that together put out 75,000 horsepower. What are you graphing when you say “PDO Phase Trends”? It appears to simply be the change from positive to negative, yet you appear to be showing a magnitude as well – either that or for some reason you decided to set the magnitude so that it appeared to track the warming. Here is a link with the actual PDO index magnitude graphed, which shows something very different. So why did you set yours to look like it was tracking with the temperatures? It looks like an attempt at deception to me. That graph also shows why your attempts to blame it all on the PDO are utterly wrong. There is no underlying trend in the PDO index, yet there is a CLEAR trend in the temperature data, a trend that nicely matches the trend in the atmospheric GHG data. Yes, the PDO is affecting temperatures, as can be seen by the graph, but it is NOT responsible for the warming trend. For example, if it is ALL due to the PDO, why was the last warm phase warmer than the previous warm phase when it is clear the magnitudes of the PDO index are essentially the same? Secondly you missed what I was saying – look at Spencer’s graph and you can see that the temps are going up again. If PDO is now in a cool phase, and that is causing global cooling, why are temperatures now higher than last year? Funnily enough, that upturn at the end nicely coincides with the end of La Nina and the transition it appears to El Nino. Right now we are warmer than at any time prior to 1998, and in the top 10 warmest years on record, and we are entering an El Nino phase that seems to be a strong one – maybe as strong as 1998. So we now have very strong solar minimum, just coming out of La Nina, and entering a PDO cool phase and STILL the global mean temperature is warmer now than at any time prior to 1998 AND temperatures appear to be heading UP again. I am willing to bet that in the next year or two we will have a new record high – PDO cool phase or not. Karmakaze – apologies, I posted in haste and wasn’t able to supply enough detail. What did I plot? The graph that you posted shows that there is some correlation between temperature and PDO. In order to make the PDO phases easier to see in my temperature graph, I took the approximate turning-points in the PDO phases as starting-points, and then did a multi-segment least-squares linear fit to the temperature graph. The turning-points are optimised both vertically (temperature) and horizontally (time). So you are correct in saying that it looks like it was tracking with the temperatures – that was what it was intended to do. But what it does do is to show more clearly the influence of the PDO on temperature. What I said was “This global temperature graph shows the phases visually. We are now in a cooling phase of a ~60-year temperature cycle, but there is also a modest long term rising trend.” – there was no attempt to say anything other than that I was graphing temperature and making the PDO phases visible, but I accept that it wasn’t fully explained. Looking at the graph, you can clearly see that the PDO-driven cycles are superimposed on a rising trend. And note that I did say this. But in order to quantify the rising trend separately from the cycles, I calculated the trend over the complete cycles – if you take a trend from one part of one cycle to a different part of another cycle, then you get a misleading figure. The underlying trend came out at less than 0.5 deg C per century, which is a lot less than the 0.74 claimed by the IPCC for the 20th century (and also outside their error bounds). You accuse me of trying to blame it all on the PDO, but I clearly did not, because I said there were cycles AND a rising trend. So when you say that the PDO is not reponsible for the rising trend, I agree, in fact that is what I was saying (but not clearly enough). Coming back to the Spencer graph. Yes it has an upturn at the end. But if you look at any temperature graph you will see plenty of upturns during warming phases, and downturns during cooling phases. So my view, which I think is extremely reasonable given the evidence, is that the upturn at the end of Spencer’s graph is just another such upturn, and, given that there is no reason to suppose that the PDO will suddenly break its pattern, the climate will continue cooling overall for another decade or two. You point out that in spite of a solar minimum, we are still warmer than we were more than a decade ago. To my mind, that’s reasonable. We have only just passed through the last PDO temperature peak, so we are still warm. 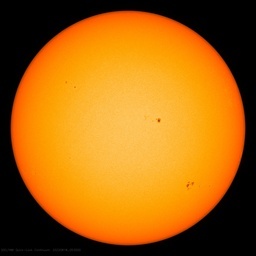 Even a solar minimum is going to take time to have its full effect on the climate. What I think some of the mechanisms are, are as follows : Both the PDO and the sun (and probably ENSO) affect the Earth’s cloud cover. As cloud cover decreases – as it did quite markedly up to around 2000 – more sunlight gets through to the oceans and warms them up. As cloud cover increases again – as it did from around 2000 onwards – the oceans similarly cool. But this is a fairly slow process, so even after they have started cooling, the oceans are still warm, and hence the climate is still warm. There is still a huge amount unknown about these mechanisms, so I am speculating not putting forward a firm scientific theory(!). My guess is that the cloud changes are local in nature, ie depending on specific local conditions, but, via the oceans, are global in eventual overall effect. So in a cooling phase, we can expect pockets of temporary cold weather (driven by local clouds) while the rest of the planet is driven more by SST and all the other usual factors. And this, I think, is what we are seeing today : there are increasing numbers of reports of local record cold temperatures, even though the “official” global temperature is rising (probably driven mainly by El Nino) as your Spencer graph showed. I don’t bet on things like this, and you may well be right about us hitting a new high in the next year or two if the El Nino continues. After all, an El Nino seems to be the overriding influence when it is present, outweighing all other factors for a short time. But sooner or later the longer term influences such as the PDO will prevail – and a quiet sun may accelerate this cooling phase. If you are betting on those high temperatures you might be well advised not to bet too much or to get long odds. For “upturns during warming phases, and downturns during cooling phases” read “upturns during cooling phases, and downturns during warming phases”. Fair enough tty. However, you are putting them all as one people, they actually went in different directions based on their geography. So, Vikings on the Swedish east coast, went past current day St. Petersburg, then down via Dnepr and Volga. That was the route to the South. Only Vikings out of Norway would have gone north to the area you describe. However, they would have been at an disadvantage trying to then turn south and down to the Mediteranian for trade. So, instead you find Norwegian Vikings and Danish Vikings traveling west and south, Swedish Vikings traveling primarily east. That leaves the White Sea pretty much out of the main routes they took. bet: I am willing to bet that Arctic temperatures will continue to show a swinging trend that follows ENSO measures related to Arctic weather. I am not willing to bet that we will be frozen in ice along the Canadian boarder in July. However, without a rising trend, my winning bet will call into question the strength of anthropogenic changes. bet: Given the nature of oceanic oscillations, and in particular the Arctic Oscillation, I am willing to bet the Arctic will also continue to see a slow return to average ice melt in the summer, calling into question anthropogenic changes. To be sure, CO2 is a greenhouse gas that contributes to our blanket and thank God we have one, but any increasing or decreasing influence that anthropogenic CO2 sources have are buried in the temperature variability sourced by the natural and highly variable weather and climate systems of Earth’s water, air, and land structures. No, what it does is (seemingly intentionally) mislead as to how much influence the PDO has. Why not just show the positive or negative changes, rather than making them trend upwards like the temperature does? That is NOT in the data, but makes the PDO look much more closely tied to the warming trend than is the case. You may not THINK you are misleading people, but that is what you are doing. Why else do it the way you did? Properly plotted, your graph actually disproves your contention, because there is nothing about the PDO that can explain why the world is warmer now than 30 or 60 years ago. The PDO hasn’t changed, so how can it be the cause? In the properly formatted graph, you can see the phase changes affecting temps, but you can ALSO see a warming trend in the temps that is NOT accompanied by a warming trend in the PDO. The one thing you changed is the one thing that gives information regarding the question of whether the warming is governed by the PDO – and you seem to think it is just a matter of style. Ok, so what is the point of your post then? If the PDO is NOT responsible for the warming trend, then it is simply another type of natural variability that has been taken account of in the models. OK, so your contention is a downturn means AGW isn’t true, but an upturn doesn’t mean that AGC isn’t true? At least that’s what you appear to be saying. The fact there has been NO downturn notwithstanding (The world has indeed kept on warming these last 10 years). No, I pointed out that we are currently warmer now than at any time PREVIOUS to 1998 – regardless of past PDO phases or otherwise – you already admitted that when you confirmed an underlying warming trend not attributable to the PDO! Basically your whole point seems to be “AGW is false, but I can’t prove it, so here are some random facts that have no real bearing on the debate, oh, and my half-assed theory as to what it REALLY is”. Sorry pal, but that doesn’t even come close to being anywhere near as convincing as the evidence for AGW. K – Either I don’t explain myself very well, or you aren’t very good at understanding me. Please stop trying to read something into what I said which isn’t there. The graph is not a graph of the PDO, it is a graph of temperatures, and the trend lines are temperature trends. It is not trying to prove that the PDO causes a rising trend, it is making it easy to see that there are PDO-related cycles and a rising trend. [“Looking at the graph, you can clearly see that the PDO-driven cycles are superimposed on a rising trend. “]. The reason that I did the phase trend lines – and which I thought I explained [“But in order to quantify the rising trend separately from the cycles, I calculated the trend over the complete cycles – if you take a trend from one part of one cycle to a different part of another cycle, then you get a misleading figure.”] – was the exact opposite of what you are accusing me of. I did it in order to be able to separate out the cycles from the trend, so that I could identify the magnitude of the trend. That is, the temperature trend which is not attributable to the PDO. I can’t take the cycles out of the temperatures, to see the trend, until I can see the cycles. There are upturns at 1879-82, 1885, 1888-9, 1890-1, 1893-9 (5+ yrs, 1 deg C), 1898-9, 1903-6, 1943-5, 1950-1, 1955-8, 1960-3, 1964-70 (5+ yrs), 1972-3, and downturns at 1852-7, 1863-4 (>1 deg C), 1869-76 (but v.near the end of the rising phase), 1915-7 (1 deg C), 1918-9, 1925-9, 1932-3, 1979-84 (6+ yrs), 1987-9, 1991-2, and, of course, 1998-2000. I changed the wording to something we could both agree on (it is a true subset of your statement and enough for the context), because I didn’t think you really meant at any time – we have countless peer reviewed papers pointing out that temperatures have been higher in the past, and the IPCC report of course “Much warmer times have also occurred in climate history – during most of the past 500 million years, Earth was probably completely free of ice sheets” (ch.6). The IPCC report also leaves open the possibility that it was warmer around 1100AD. The warming trend in my graph is only identifiable for 150 years max (the whole data period), as are the cycles. I indicated that we can’t assume anything from it going forwards [“We can’t be sure that the phases will continue exactly as a continuation of the pattern, because we don’t understand the mechanisms.”], and I don’t think it’s at all unreasonable to expect not to be able to deduce anything going backwards either. (We could use other studies and other data for going back further, but not this data). The debate is all about temperature changes and what causes them. We are in a very interesting situation at the moment, where “record cold” reports are pouring in from various locations, even though in the context of the last hundred years or so, the planet is still quite warm. I haven’t seen an explanation anywhere, and I’m pretty sure the IPCC’s computer models can’t throw any light on it (I’d be happy for you to prove me wrong), so I thought that a bit of “thinking aloud” about it might be a positive way of opening the topic. [“I am speculating not putting forward a firm scientific theory(!)”]. Well, that’s your opinion. It would be more constructive to prove me wrong or put up an explanation for the “record cold”s, but it’s a free world. It’s a real world too, and the problem with the AGW case is that it doesn’t even remotely match what is going on in the real world. (That’s my opinion, again you’re welcome to prove me wrong). It shows temperature, cycles, and trend. Note that the trend is based on full cycles only. OK I seem to have been totally misunderstanding you. When you started talking about the PDO, I thought you were saying it was responsible for the warming trend, but you’re not. Then I thought you were saying it isn’t responsible for the warming trend but will be responsible for a cooling trend. After that last post I’m not sure you’re saying that either. Well maybe in the loosest general terms, but no one is debating that temperature changes naturally. We aren’t really debating the causes of temperature changes, we are debating the cause of one specific temperature change, which you already admitted is not caused by the PDO – the global warming trend – which is why I’m confused as to why you keep focusing on the PDO then say “but it isn’t the cause” (apparently). Irrelevent. There are record highs pouring in from all over the place too. Climate change isn’t just one way, there can be local cooling due to global warming regardless of how counter-intuitive that seems. Mainly because there isn’t ONE explanation. One explanation for many of the cold reports are the changes to snow and rainfall. Warmer air can hold more water which leads to greater precipitation. More snowfall for example can lower temperatures where the snow falls. This is why there is an ice buildup in some areas of the Antarctic: there is more snow falling from warmer air, but the temps are still well below freezing so more ice forms than would have been the case. Let me just close out by asking straight out: Is a change to the PDO responsible for the warming trend? Or is the PDO going to be responsible for a cooling trend despite not being responsible for the warming trend? What are you trying to say? The answers to your 2 questions are No and No. After I had taken out the cycles, the trend was less than 0.5 deg C per century. The IPCC used 0.74 +- 0.18 as their temperature trend. Apart from showing that there obviously was a relationship between temperature and PDO, the main message was that the IPCC was using too high a temperature trend. The IPCC Report shows that their wrong temperature trend ended up in their climate sensitivity (ECS), so that is also wrong. And the ECS is the basis for all of the IPCC temperature projections.